"I think I'll go with an electric motor. How much time is is on the electric motor. What is the easiest way to transport the pro angler"
Most electric trolling motors require an external battery, that you'll have to buy in addition to the trolling motor. There are a few important variables that dictate what setup you'll need. First, decide on what size motor you want. The larger the motor, the larger the boat it can push. Kayaks aren't that large so any motor between 30-55 pound thrust will work great. The battery size to choose will depend on how you plan on using the motor. Unfortunately, its hard to say exactly how long the battery will last between charges. That depends on the total boat weight (kayak weight with everything loaded including yourself), size motor, throttle position, duration of particular throttle position, and also external conditions such as wind, waves, and current...For me, I wanted a battery that would last as long as possible when at full throttle because the motor's primary use would be for going long distances, and secondary as a backup for fighting strong currents and maneuvering. So I chose the largest marine deep cycle battery I could find within a reasonable price range (still cost more money than my truck battery). With batteries though its a trade off...The larger the battery, the more weight...My electric motor weighs 18 pounds, but my battery weighs 65 pounds. Thats alot of weight for a kayak, but fortunately the PA can handle it. And most of the time I use my PA in open water miles from shore and fish alone, so I need the added security. I love my Torqeedo but it is definitely not built for a Pro Angler. Not sure what your saying here.... Are you talking about the rear mount of a Torqeedo? Why wouldn't you use the Mirage Drive mount for the Torqeedo? Good question. I don't like the mirage drive mount. For me it defeats the purpose. I want the engine to suppliment the Mirage drive. 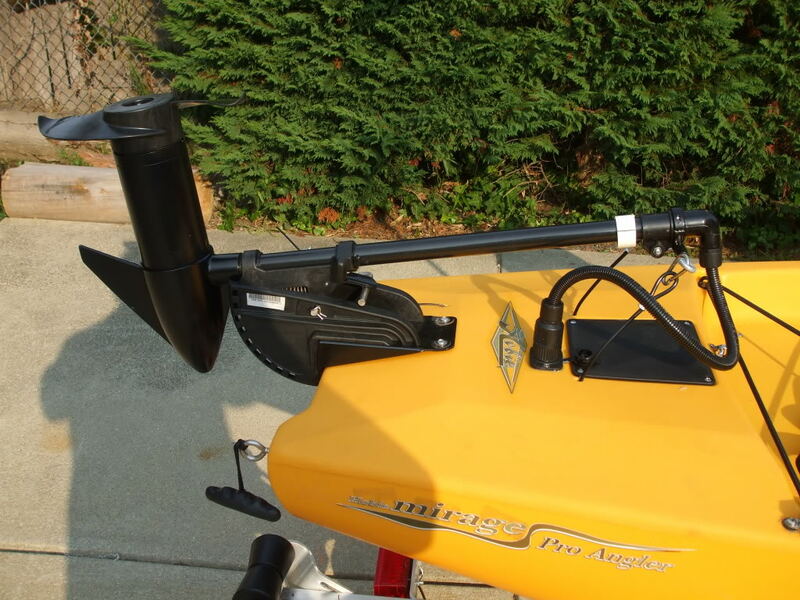 Some of the places I fish have very strong currents and I can use the mirage drive and the motor at the same time. I can't with the mirage drive mounted engine. Second, my personal opinion is that ( for me at least ) it is dangerous. I have used the mirage drive before and hit an oyster bar and a sand bar with it that came up quickly. The place where the PA's seem to fail have been around the Mirage drive. Can you image the damage that could happen to the motor and the PA if you hit an oyster bar at full speed? In addition, if I used the engine to go out to a place and it got rough and I ran out of batttery, I would have to open hatches to exchange the engine for the mirage drive. This could be very dangerous in building seas that can and does happen fast. Face it. You don't paddle the PA very easily for any distance against seas and current. The rear mount takes care of all of these problems. It you hit a bar it will pop up. If you get into trouble or you are out of battery ....... you immediately just pedal .......... the mirage drive with the engine will also give you more power against current. You can't do this when the engine is in the Mirage Drive opening. I know guys that have the drive mounted Evolve and love them ......... It's just not for me ...... again personal opinion, not starting an argument. I would have gotten a Hobie Evolve but they don't make a rear mount for the PA. THe mount they have for the Outback and the Revo is GREAT ...... the twist and Stow. It lays on the back deck when not in use and a quick pull and it's in the water ......... it's attached to the rudder so steering is a breeze and reverse is not a problem. It's wonderful .... I know several guys that have them. Unfortunately, Hobie won't do anything for the people that buy the PA and Torqeedo won't because they don't want infringe in anyway on Hobie since they make the Evolve for Hobie. So us PA owners are stuck and have to figure it out for ourselves. As I said ...... love the product for all of it's advantages ........ hate buying the flagship products and then left out in the cold ........... and Hobie simply ignores us .......... when asked here on this board they just say ....... yeah we started to look at it ...... and that's all we seem to get. Hopefully they will do something in the future but I'm not holding my breath. Anyway ....... hope it answered your question. I think I'll go with an electric motor. I agree with Yak Fish's reply. From my perspective he is correct in everything he said. I have a Minkota 30# engine, Another 45# motor, IslandHopper side Mount and a Torqeedo Rear mount. I use the Torqeedo the most ...... well exclusively now. The Torqeedo engine, mount, controller and battery weigh 15 lbs and take up very little space and give me 4.5 - 5.5 mph speed. The battery lasts basically all day if you don't leave it on high speed all day ........... I used it about 6 hrs of normal fishing ...... running, trolling and stopping and casting and left the water with 20% battery left. The Torqeedo batteries will just about go to 0 where as the regular batteries will usually quit around 30% because the voltage drops below what the engine requires. I keep a second battery on board. The battery has a computer and a GPS built in that tells you the distance speed and time/distance left in the battery at that speed. It also has a kill switch built in so it won't keep going if you fall over. It will also turn off if you turtle. The battery is small enough to put it beside the seat and it is so light, it floats .......... Disadvantage is that the Torqeedo Ultra light costs $1700. When you add up all of the costs of the others including the batterys, charger etc ...... it's a few hundred more than the Bass Yaks and other systems. Things about the other systems were the weight and the side mount made me reach to turn to do something. when I reached too far, the big battery shifted and almost turtled me .......... I didn't tie it down right. It also took up alot of room .......... couldn't fit the Hobie Livewell and the big battery together ........ but I only tried once ......... I also didn't get over 4.4 mph and the battery didn't seem to last as long as the torqeedo ........ again guys ..... not an argument .... just what I found. The Torqeedo has some disadvntages .... in my opinion, it needed a backing plate and a special way to attach the backing plate since your arms can't reach. I had 1 made with the nuts in it and used the Yak Attack bullets to attach the backing plate. A backing plate comes with the Torqeedo but since you can't reach the area of the mount from the inside, it was of no use. Also, I tried to use the Hobie rudder with the engine to steer but the side mounted DF transducer that I have created too much drag that made steering difficult at higher Torqeedo speeds. I think I have a solution for that but haven't rigged it yet. Also, the engine pivots backward so you can pull it up when not in use. Because of this you can't use the reverse. I need to work out something for that. But all in all ....... I like the engine. Another thing I like is that the whole thing (engine, battery and controller) can be installed or removed in about 2 minutes or less and it comes with a storage bag. I also have a Yak Attack Gear trac mounted on the PA side rail and the controller is mounted on that using a Ram mount ...... the controls are literally at my fingertips and can be adjusted for my comfort. Other 1's out there like the Bass Yaks and the Island Hopper have these things worked out already but they still have the weight and space concerns. As far as transporting, Yak fish is right on the 3 methods. I prefer the PU Truck w/ bed extender. It' makes it very easy to just slide it in and tie it down with out breaking your back. This has worked out pretty good for me. The Bassyaks System is a rear mounted 12 volt Modified Minn-Kota, look into the 45 ib.thrust motor with the 3 bladed performance propeller, the top speed will be higher than the brushless motor , your run times will be longer than the foreign motor as you'll be able to run multiple batteries, don't run the larger batteries (27,31), run an AGM 22-NF 55Ahr or 2 , with the electronic throttle control , the smaller batteries seen to hold a straighter discharge curve than the larger batteries and will recharge quicker. I see you mentioned the 3 blade performance propeller. I have the bassyak kit on my PA with a 40LB Minn Kota and the 2 bladed Weadless propeller. How much of a difference does the 3 blade really make? Any know issues on swapping them out? I do not get much speed if there is any current and would love to bump it up if possible. If I had it to do over again I would even try to bump up the engine to a 55 or 65 Lb thrust. BTW, I do use two batteries, agm, 22, 55ahr and have had to replace both right at the 1 year mark. Luckily they had a complete 1 year warranty and the dealer replaced both. I have to put one sideways inside and the other straight up.